← Eat, Fast and Live Longer. A 5-2 Fast Diet Recipe Idea Under 300 Calories. Cold Sesame Soba Noodle Salad With Smoked Salmon, Spinach And Cucumber. This week has been a frantic whirlwind of activity. With Easter coinciding with the end of school term holidays, I’m looking forward to having all my family under one roof and getting away for a long weekend break. There will of course be lots of bonding as we gather together over long leisurely meals. Not wanting to spend a minute more than I have to in the kitchen, I’ll be concentrating on bringing to the table platters of food with an undeniable wow factor that come together with little effort, yet taste like I spent hours on preparation. Dishes like this. 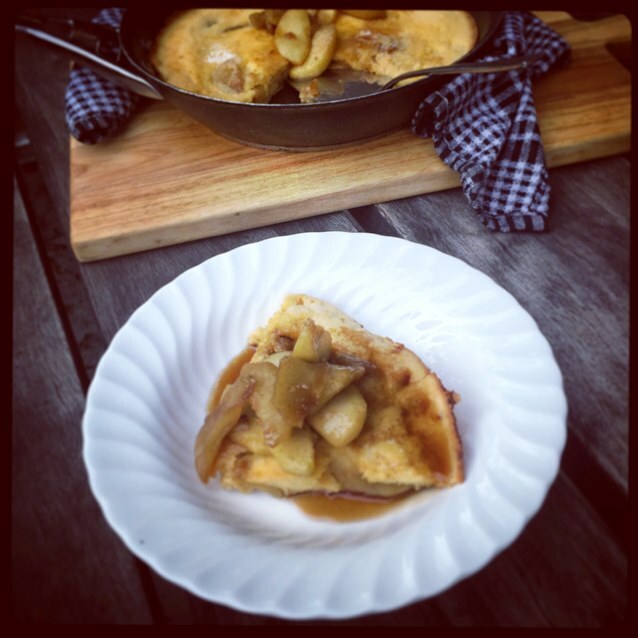 Caramelised Apple Dutch Baby Pancakes. A one pot, or more appropriately skillet, wonder. Prepared on the stove top and finished off with a quick blast in a very hot oven, it’s a clever Dutch take on a perennial family brunch favourite. No time consuming standing in the kitchen and flipping pancakes required. Rather, a whole bowl of batter is simply poured into a hot skillet and baked to golden puffy perfection. I have no idea why these are called Dutch baby – there’s nothing small or diminutive about them at all. To make my pancakes just that little more special and Easter Long Weekend brunch worthy, I added caramelised apples to the mix. Taking advantage of gloriously crisp, sweet yet tart, new season Granny Smith apples. Oh, and one last admission, to feed my rather greedy family I made three batches. Another huge departure from my seriously healthy 5-2 fast day recipes I know. But…it is Easter and I’ll be celebrating and feasting, and hope you will be too. SIFT the flour, sugar and salt into a large mixing bowl. Make a well in the centre of the bowl. ADD the eggs and a little of the cream. Using a wooden spoon, stir from the centre gradually drawing in the flour from the sides of the bowl. GRADUALLY add the remaining cream. Beat well until the batter is smooth. ALLOW batter to stand in a cool place for at least an hour. MEANWHILE melt two tablespoons butter in a 20 cm oven proof, heavy based skillet over medium-low heat. ADD apples, sugar, cinnamon, and salt. Toss gently to combine, then cook, stirring occasionally, until apples are soft, about 10 minutes. SPOON half the caramelised apple mixture into a small bowl and set aside to use as a topping for the baked pancake. ADD the remaining two tablespoons butter to the skillet. When butter has melted pour pancake batter evenly over the caramelised apples. CAREFULLY transfer the skillet to the oven, and bake, uncovered, in a hot oven for 15 -20 minutes, or until golden and puffy; when cooked the tip of a knife inserted into the centre should pull out clean. SERVE immediately with reserved caramelised apples and a generous drizzle of maple syrup. This entry was posted in Baked, Breakfast, Fruit, What I Love to Cook and tagged Apple, Autumn, Brunch, Caramel, Easter, Eggs, Pancake. Bookmark the permalink. 2 Responses to Easter Long Weekend Brunch. 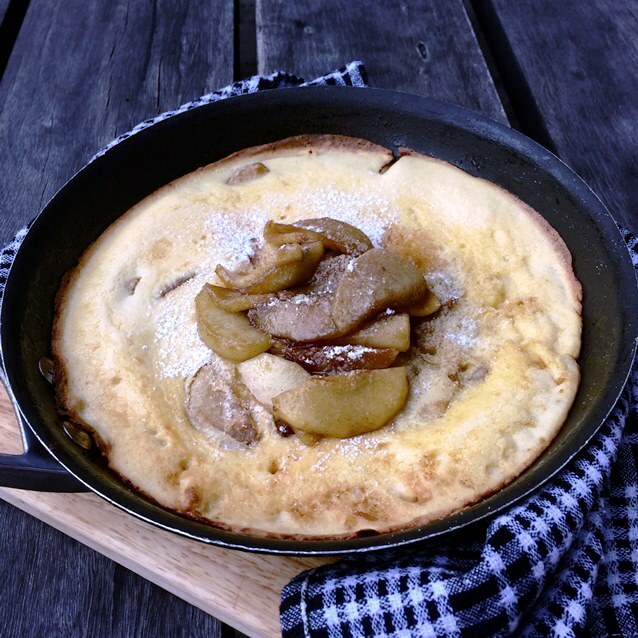 Caramelised Apple Dutch Baby Pancakes. Glad to hear you’ve enjoyed some Easter feasting – these pancakes look delicious! They were – and so easy to throw together. There’s nothing better than a holiday feast.